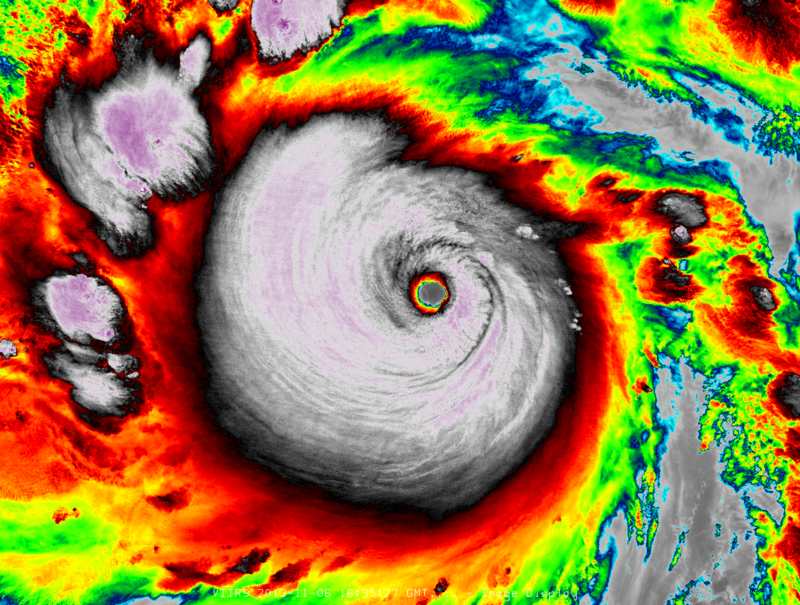 Much of the big news over the past 24 hours has been the very impressive Super Typhoon Haiyan. While the jury may still be out on whether or not it attained “most intense landfall in history,” I think we can all respect the immense power this storm possessed. One interesting aspect was the burst of intense lightning (mainly cloud-to-ground) that occurred in the southeastern eyewall just before landfall. I’m not exactly sure why this occurred as there was no evident eyewall replacement cycle (ERC) and definitely no shear/dry air nearby. So, could this have been due to friction with the nearby islands? Was it still strengthening (although you would expect more lightning in the outer rainbands)? It is interesting to note nonetheless and I’m sure it was hard to even hear any thunder with that kind of wind (~170 knots at landfall). The animation shows the quick ramp-up in lightning activity just before landfall with an apparent peak around 2230 UTC on 11/07/13. MTSAT 2 km Infrared with 30-min GLD-360 Lightning Density at 2230 UTC on 11/07/13. MTSAT 2 km Visible image valid at 2230 UTC on 11/07/13. . .the same time as the intense burst of lightning. The first visible image from MTSAT reveals a beautiful, but deadly storm. This image was received at the same time the lightning burst was occurring. VIIRS Infrared image (375 m resolution) courtesy of Dan Lindsey (CIRA) valid on 1639z on 11/06/13. I have included a radar animation of Haiyan’s landfall below courtesy of Brian McNoldy (U. of Miami/RSMAS) and a VIIRS Infrared image captured by Dan Lindsey (CIRA). Thanks to some hard work, we have been receiving VIIRS imagery from NASA/SPoRT and CIMSS (mainly over CONUS and Alaska), and we are looking forward to receiving this kind of imagery over a broader domain in the next couple of years as the detail is incredible!